Up until the day everything changed, Marty thought he lived the perfect life. Marty had the wife, the colonial framed by a white picket fence, and two picture-perfect children. Marty was reserved, logical, and in control. Marty was a top earning financial advisor. Marty was awash in money. Unfortunately, Marty also washed money… for a cartel kingpin. And on the day everything changed, the cartel has come knocking. Marty’s business partner has been caught lining his pockets with some of the proceeds and the consequences are swift and severe. Marty, resourceful as always, begs for his life and bargains his way into a new, but far less profitable arrangement: he must move his family from Chicago to the Ozarks in Missouri. Once in the Ozarks he has only a few months to launder millions of dollars or his family won’t make it out alive. For those of you behind on your streaming, we’ve just summarized the first episode of Netflix’s Ozark. This Netflix original drama has been building a following over 2017; it is a classic slow-burn story (think Breaking Bad) but with a macabre edge. Ozark is a classic cautionary tale. Marty had signs – those cracks in his ‘perfect’ life – the tension building all around him, but he chose to persist. Of course, what really makes a cautionary tale is a lesson; in the case of Ozark, the lesson is that money is a powerful tool… for both good and evil. The Trial Master File takes this lesson into consideration. As part of the trial master file, all investigators must provide documentation that their financial relationship with the sponsor is not arranged in a way that could compromise their responsibility to the safety of the patients and the quality of the data. For this reason, since 1991, regulations specific to clinical trials has required disclosure of potentially influential financial arrangements. On March 1, 2013, the U.S. Food and Drug Administration released a final guidance entitled, “Guidance for Clinical Investigators, Industry, and FDA Staff: Financial Disclosure by Clinical Investigators”. The guidance outlines how to maintain compliance with 21 C.F.R. part 54. Under 21 C.F.R part 54, applicants who intend to seek marketing approval for a drug, device, or biologic must document specific information regarding their financial interest and arrangements surrounding any covered research. (v) Any steps taken to minimize the potential for bias resulting from any of the disclosed arrangements, interests, or payments. The specific dollar amount thresholds (equity exceeding $50,000 in value or other ‘significant’ cumulative payments more than $25,000) come from FDA guidance, not from the Code of Federal Regulations directly. Interestingly, checking yes to any of the items, or exceeding any of the monetary thresholds does not bar one from participation immediately, but puts the marketing submission at risk if the FDA does determine “that the financial interests or arrangements of any clinical investigator raise a serious question about the integrity of the data.” The FDA reserves the right to “take any action it deems necessary to ensure the reliability of the data” 21 CFR § 54.5(c). Of course, all the actions the Agency could take have the potential to jeopardize the financial and regulatory viability of the clinical trial, such as: increased Agency audits, requests for further analysis, mandates for additional independent data, or refusal to accept any data from the compromised trial for use in the premarket submission. Because of these risks, a sponsor will usually take a very conservative stance on any declaration that has the possibility of negative interpretation by the FDA. The investigator in a clinical trial holds ultimate and final responsibility to safeguard the safety of subjects and the validity of the data. He or she must be the example of ethical research for all his or her subordinates. One doesn’t need to watch Ozark to know that money can cloud judgement and lead even the most principled individual to stray from morality. 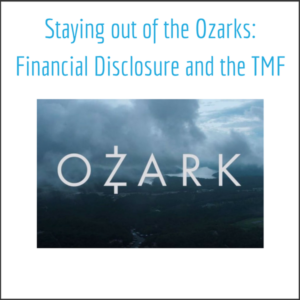 Fortunately, the TMF stands ready to hold us accountable – by recording our high standards and demonstrating our continued commitment to them.